Product of California. Pack of 2. Kosher for Passover. Gluten free. Kosher Chicken Broth, Reduced Sodium 45% Less Sodium Than Swanson Regular Chicken Broth, No Artificial flavors Or Preservatives. 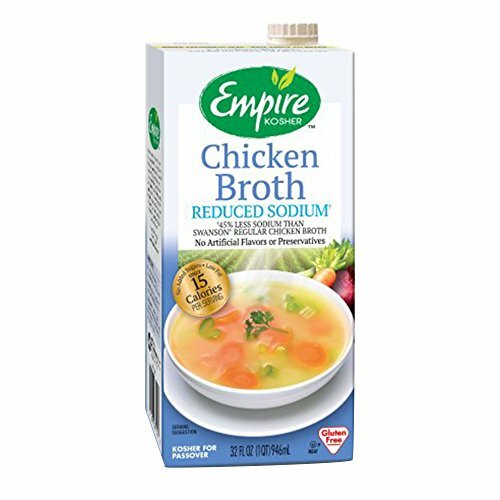 This Broth Contains 470 mg Sodium Per Serving Compared To Swanson Regular Chicken Broth Which Has 860 mg Sodium Per 1 Cup Serving. Ingredients: filtered Water, Chicken Meat, Yeast Extract, Chicken fat, Salt, Onion Powder, Turmeric, Garlic Powder. Kosher for Passover. Gluten Free. If you have any questions about this product by Empire Kosher, contact us by completing and submitting the form below. If you are looking for a specif part number, please include it with your message.